 AllSurplusWorld has created access to the industry. Selling surplus equipment is primarily a matter of reaching people. For centuries we have been building a contact database to encourage the trade in surplus industrial equipment. We continue our efforts to maintain and expand the database. When a buyer is in the market we find them. Sell your own equipment. Send us the details of your equipment and we inform the industry. You will pay us compensation and a finder’s fee. Having handled a lot of equipment and projects for many years we have a lot of expertise and knowledge to assist you with the disposal of your surplus equipment. If required we shall be happy to offer a turn key solution. Tell us How to Assist you.